African Revival is a UK based charity which aims to help primary school children in Northern Uganda, Zambia and South Sudanto access quality education. The charity works with over 40 primary schools in these countries and delivers a range of projects from capital works such as new classrooms,boreholes and teacher housing through to teacher training and savings and loans schemes for parents. BFSS provided a grant of £10,000 to equip Koch Lila Primary School with vital desks and books. The School, situated in the Nwoya district of Northern Uganda, is in a very rural location around 75km from the nearest tarmac road. During the long civil war theSchool moved to a displacement camp and Africa Revival has helped to rebuild it nowthat the community have finally returned to their homes. The School faced many shortages when it returned to its original site. In 2012 there were only 50 desks for 500 children and in the upper years 20 children were required to share each text book. 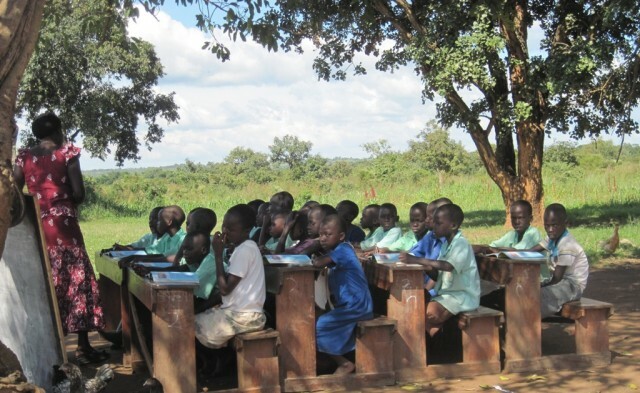 With the funding from BFSS, African Revival was able to source 140 new desks for the children from Lakica Wood Workshop, a local carpentry business.In addition, almost 1,000 new text books were sourced locally in Gulu from the Public Choice Bookshop. These new resources mean that children will no longer be sitting on the floor for their lessons and will have the relevant books to help them learn. African Revival has gone onto provide the teachers with training on howto make the most of their new resources and the school term this year starts with a new emphasis on quality education.